5 of My Favorite Universal Studios Rides & Attractions - Top Ten Travel Blog | Our experiences traveling throughout the US. Universal Studios and Islands of Adventure are both great theme parks-we had as much fun here as we did at the 4 Walt Disney World parks! In addition to fantastic movie themed rides, Universal also has great live shows and entertainment. And when you are done with the parks, you can head over to Universal City Walk, which is loaded with fun things to do. 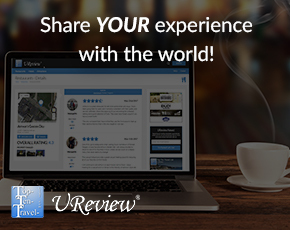 Themed restaurants, nightclubs, live shows, you can find it all at Universal City Walk. 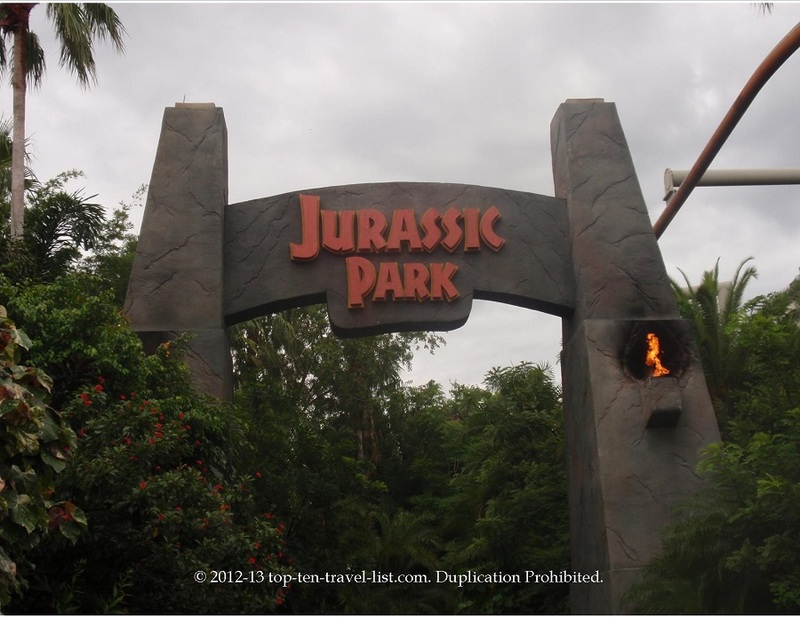 Take a look below at a few of my favorite attractions at Universal Orlando. What are some of your favorites? 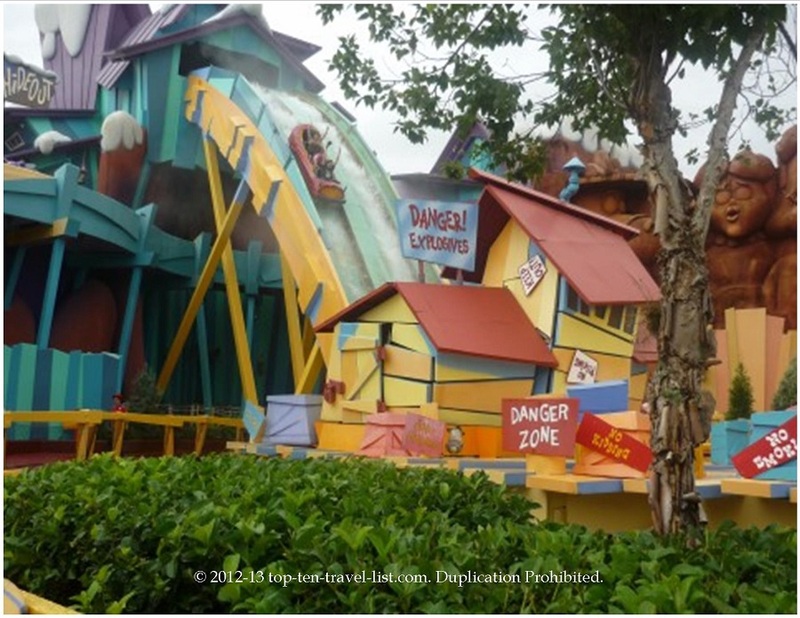 Dudley Do Right’s Ripsaw Falls is one of the most underrated rides in the park! This log flume water ride was one of the best in any of the parks – what a fun ride! And no line too! We were able to go on this ride several times in a row. Don’t skip out on this fun water ride at Islands of Adventure! 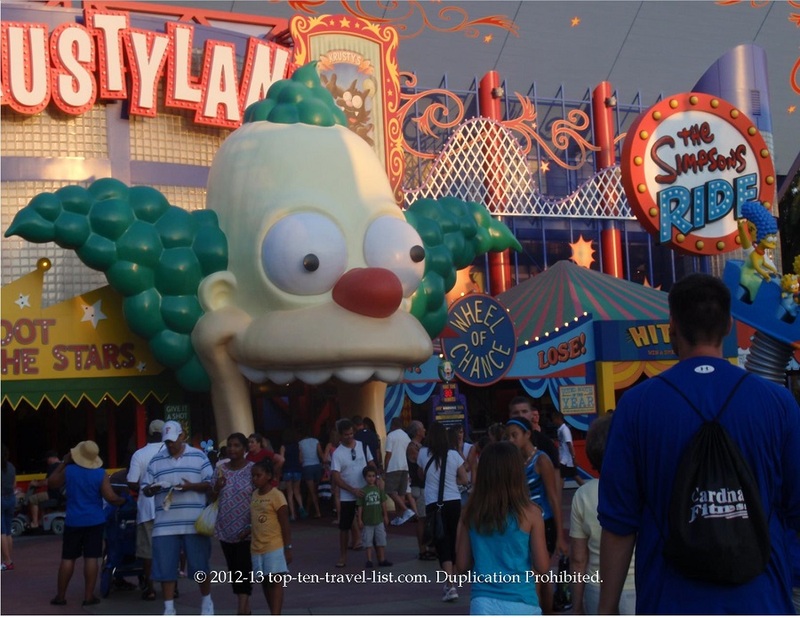 Love The Simpsons Ride! This clever ride accurately simulates being on a real roller coaster! 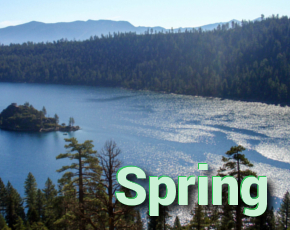 I actual had the same queasy feelings like on the big drops of a roller coaster, and The Simpsons theme was nice too. I highly recommend this ride on your trip to Universal Studios! Jurassic Park: The Ride is a fun experience – awesome animatronics and a surprising drop at the end makes this an exhilarating ride. Don’t miss this one at Universal Studios! 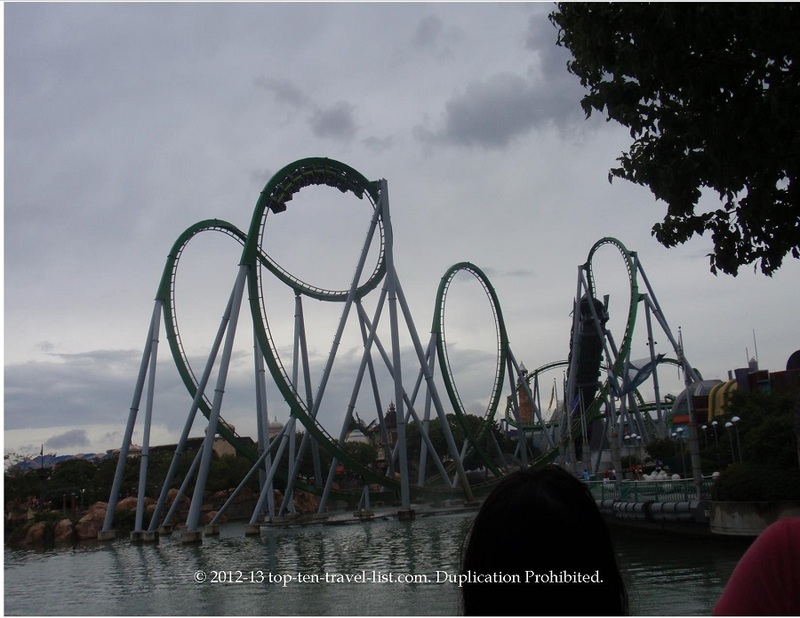 The Incredible Hulk Coaster is a fun, fast coaster. Lots of twists and turns made this the best coaster of our trip. Make room at Islands of Adventure for this one! 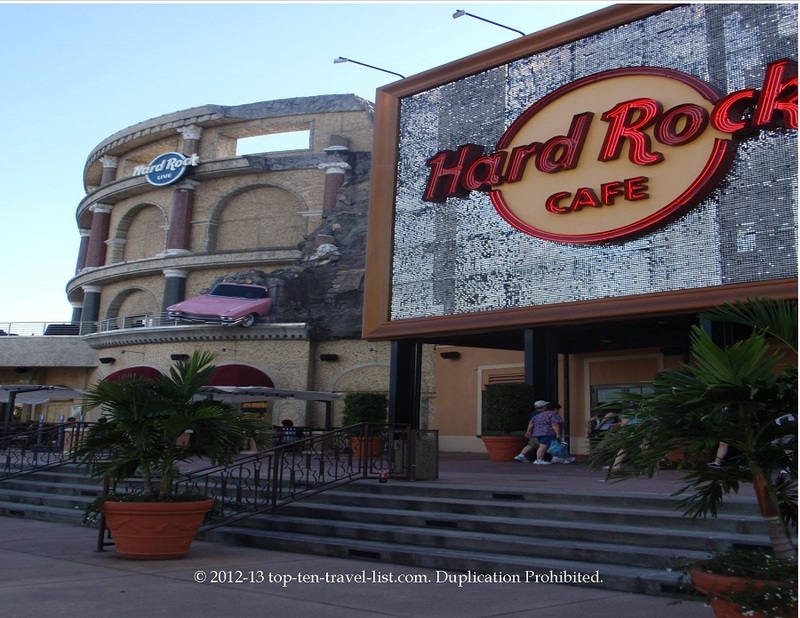 I love the Hard Rock Cafe at Universal Orlando City Walk. This great rock themed restaurant features great food (I highly recommend the spring rolls!) great music, and great memorabilia adorning the walls. Amazing Spider Man – Great 3D simulator ride at Islands of Adventure where you really feel like you are jumping off buildings with Spider Man! Revenge of The Mummy – Fantastic roller coaster at Universal Studios with realistic looking special effects like fireballs and beetles! Twister – Fun ride at Universal Studios were you get to stand by and watch a tornado. The neat part of this ride experience is that it really feels like you get to experience a tornado as a spectator complete with the high winds and watching how fast the tornado causes complete destruction.